My mother in law is better than yours. Either way if you have a mother in law, this little project could work for you. I created this cute box specifically to hold these little pan scrubby things in. You would think I would have a photo of the pan scrubby things but I don’t. Because I put then in the box and sealed the box on the video and didn’t think to take a photo of them before putting them in the box. So if you want to see the pan scrubby and hear the story about them and why I would give them as a Mother’s Day gift you will have to watch the video. + BOX LID: Cut Very Vanilla card stock at 8-1/2″ x 8-1/2″, score at 1-3/4″ and 6-3/4″ on both sides. 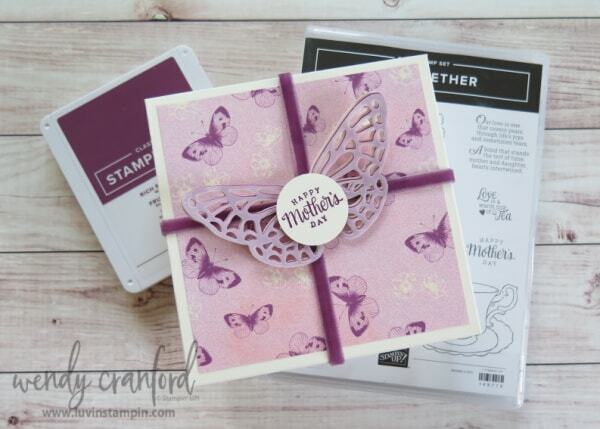 + BOX BASE: Cut Very Vanilla card stock at 7-1/8″ x 7-1/8″, score at 1″ on all four sides. + Burnish the score lines with a bone folder. + Trim in on the two score lines on each end of the base and lid. Supplies are listed below. Click on any of the images to purchase the item in my online store. Adorable box! Thanks for sharing! I love the scrubbier also. I have a hard time finding them. Always stock up with I find some! I have really enjoyed the stories about the women in your life. Cute box. I love the scrubbier. I think Linda is the same lady that made our bedroom valances and also does alterations for some of the girls uniforms at the bank. She is the best! I did not know she sold some of he items. What a great story!